Posted in appetizers, Fulbright, Middle Eastern, recipe, savory by Antonio Tahhan on February 8th, 2011. You can follow any responses to this entry through the RSS 2.0 feed. You can leave a response, or trackback from your own site. Woww… I can’t believe you have been blogging for more than 13 years. I have been at it for only six months now, and I can’t imagine being without my blog. It is an extension and a personal discovery. Also it’s like everything you do, see, eat, experience is in relation to my blog now. It’s like sitting in a cafe and sharing with your readers. 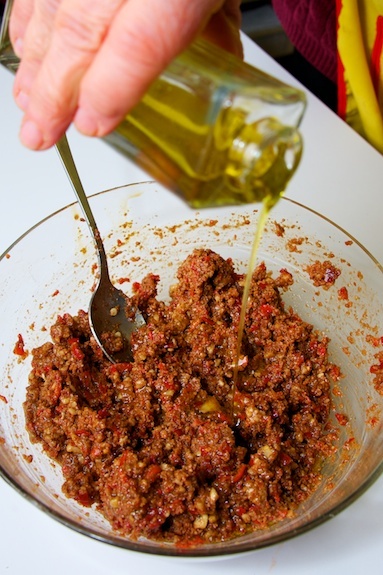 As for muhammara, we always used to have some in the fridge, made by an Armenian friend when I used to live in Beirut. She used to bring me some when I was living in London and when I go back to Beirut, it is always a must on the table. 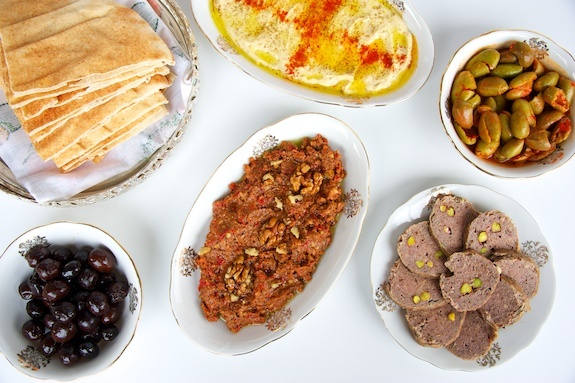 I envy you for being in Halab, I just love Syrian food and Halabi food has its own reputation for being great! Muhammara is one of my favorite mezze but like many Middle Eastern dishes, there’s always several versions. Personally, I like mine a little on the sweet side and less on the spicy side. Does the pomegranate molasses gives it that sweetness? Also, in many recipes I’ve read, the red peppers are usually roasted but I noticed that you keep yours raw. No doubt its healthier but I’m interested in knowing why you kept it raw. Does roasting it lessen the strong flavor of peppers (something I’d personally prefer). Mich: No, no I’ve only been blogging for 3 years 😀 I don’t think I knew what a blog was 13 years ago hehe. 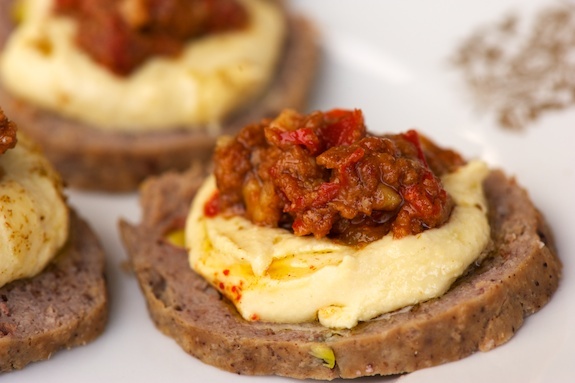 I’m curious, did your Armenian friend have a different spin on Muhammara? 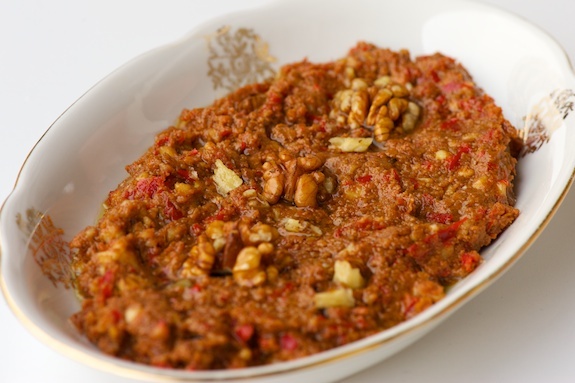 As HJ mentioned, there are so many variations of this dish… it would be interesting to trace how Muhammara has evolved within different communities in the Middle East and across the Mediterranean. Hi HJ, thanks for the comment! There are so many variations for this dish, it’s hard to keep track of them all. The pomegranate molasses does add sweetness, but it also introduces a bit of acidity, which is why my aunt adds that dash of sugar. I am jealous, I wish I was there too… Enjoy your trip. I loved your post, Muhammara is one of my favorites. My family traditionally has always used the jarred roasted red pepper and it’s wonderful. I will however try this version with the raw red peppers. Thanks so much for sharing, I hope you post again soon. This sounds delicious! Is there any substitute for pomegranate molasses? Thank you for this great post! 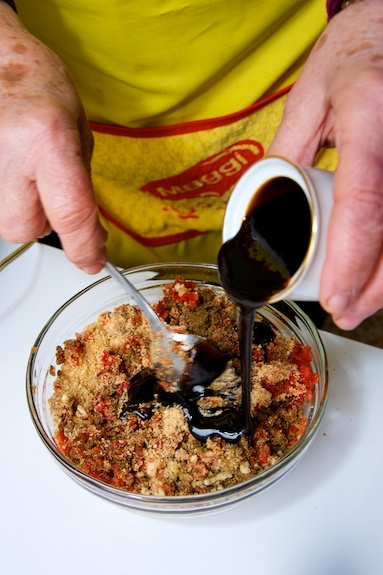 My family and I are from Halab and we usually add lemon juice, and tahine (sesame paste) along with all the other ingredients you mentioned. You should try it, its great! marhaba..your work and blog are much appreciated.I always thought that the red peppers had to be roasted and then skinned for this exquisite spread? Sunset looks beautiful, Tony. I hope to visit Halab for the first time this summer. I love muhammara! It’s probably my favorite Syrian cuisine. I can’t wait to try this recipe! first time commenting on your blog, but certainly not the first time i’ve visited and fallen in love with the recipes. i’m Palestinian-American (now living in Australia), and constantly inspired by the flavors and aromas of our heritage. 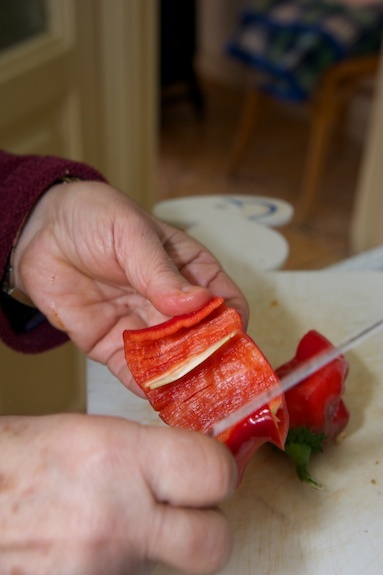 this muhammara looks delicious, and the hands in the photos look like my Teta’s, as if she were making it. i’ve just started blogging as well, and though i’m only a month into it, i find it as invigorating, humbling and community-driven as you describe it to be. 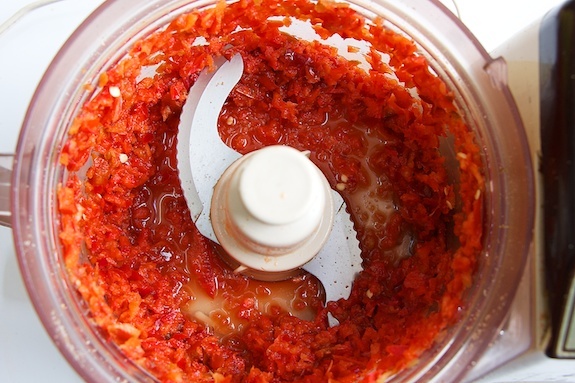 Love you recipe for Muhammara! Beautiful pics as well! I have been following your blog for a while now. It’s fantastic-on every count. Presentation, charm, great writing voice and, of course, food! It’s been lovely following your posts from Syria, too. I’ll be preparing muhammara tonight, following your instructions! Love the video clip. Just goes to show one never knows about life. You got a Fulbright instead of a Food Network show (at least for know!). Much better opportunity and a stepping stone to grander, spicier things. Are you considering combining more formal academic studies (food history, sociology, what have you…) with cooking somehow. I look forward to keeping up with your work over the years…thanks for sharing with us! 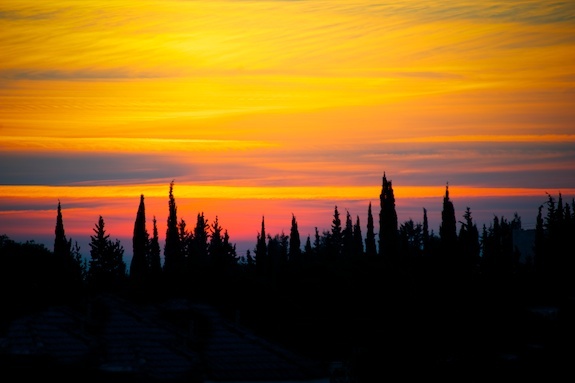 BTW, the sunset photo is stunning! Hi Paula: thank you for the comment and compliments on my blog. I am considering formal training in anthropology, perhaps a masters, since my background is in math and economics. I took a course called anthropology of food in college where I developed an academic interest in the intersection of food and culture, particularly in the Mediterranean region. I would also like to incorporate blogs and other forms of social media into my studies as they’ve served as practical and dynamic platforms for cross-cultural dialogue to take place. Wishing you luck in all your endeavors-you won’t need it though! And you have built a global community eager to follow, learn and taste in years to come! Thanks for taking the time to respond to my question…. Muhamara is through and through strictly from Aleppo. It is of late that it started crossing borders and as with all recipes, variations and ownership start cropping up. Your Aunt is right on the money as Sugar is indeed part of the original recipe. ok great..do people still make these at home and send them out to be baked ? homemade ones are usually better! Oh, this is definatley going to be my new fav snack! Just found out about your blog. Congratulations. Good job at documentation of our food (Turath). I love your stories and recipes. 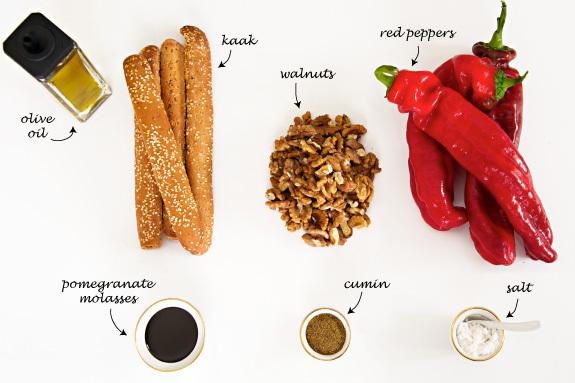 Have you ever tried the Muhammara without Ka3k?. 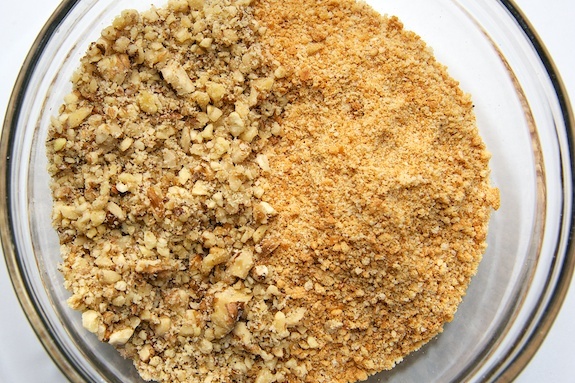 My mother used only walnut ,never with ka3k or bread crumbs..otherwise very same recipe. Thanks for posting I love to cook( our food). I made the muhammara , using roasted red peppers in a jar, came out pretty good, just to simplify. ssurely the use of fresh peppers roasted is great , but this substitution also very good. I was taught how to make muhammara from a Syrian Chef who used a salted chili sauce that he brought with him from Syria. It was bright red, chunky, salt and spicy with the seeds and looked kind of like Chinese doubanjiang(minus the beans). I never caught the name of the sauce, any idea what it might be called? Also, if you’re using fresh chilies, do you use Aleppo peppers? been in the US for over 30 years , born in Beirut, with a huge family in Aleppo , which has whittled down considerably with all the troubles since the 70’s and 80’s,very happy to have found your blog, was looking for the morttadela recipe my Mom used to make and yours is very close , thank you for that, and Muhamara she made she used a very specific type of pepper and paste all either made at home or store bought from a specific store,the peppers in the Image you have above do not look like bell peppers, what kind are they?flehfleh Halaby? they do sell similar looking peppers here but would like to hear your advice. thank you for a wonderful blog and great info to keep in touch with our heritage.